I regret making this cake. Not because it wasn't good. In fact, it's quite the opposite situation. After tasting it, all I can think about is digging my fork into a dense, rich slice and swooping it into my mouth. Why, oh why did I not make another? It seemed the sensible thing to do at the time, but now I've learned. From now on I will make double of everything. 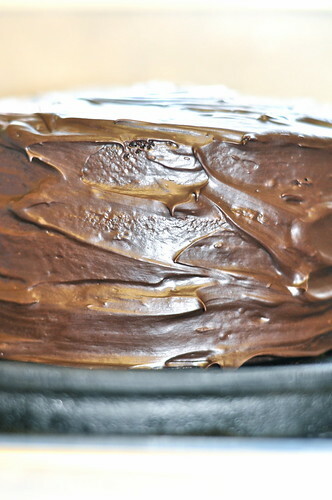 Until this cake, I never craved chocolate cake. I wouldn't turn down a nibble if a friend had a slice for dessert, but I easily could have passed it up. Mostly, I was captivated by mouth-puckering lemon tarts, warmly spiced tea cakes, and nutty cookies. Now I'm beginning to reconsider. Is it possible that I actually like chocolate cake? A lot? I think the Guinness played a big part in my conversion. It rounded out the flavor of the chocolate, making it less sweet and more intense. 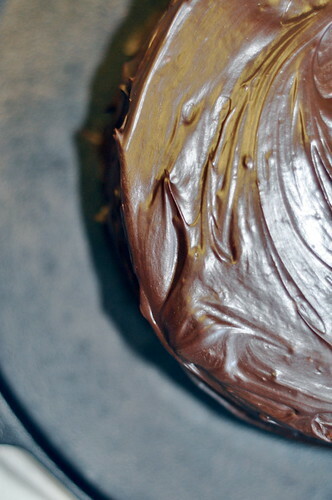 It helped add a bit of a buttery flavor and really contributed to the moistness of the cake. My first reaction to putting beer in a cake- yuck. I don't like the flavor of beer, so I couldn't imagine it would be any good in cake. However, it was a friend's birthday, and it sounded like the perfect dessert for him. Everyone deserves a little something sweet on their birthday, so it simply had to be done. Lucky for me, it was not as difficult as its ganache-coated three layers might indicate. It took me a little over an hour from start to finish, and it was well worth the effort. I brought the cake to breakfast with (secret) hopes of having a sliver for breakfast. No luck. Ellie and I rushed back at lunch, trying to sneak in at the end of the celebration for a crumb or two, but he had decided to wait until dinner. Phew. Let's just say that was the longest meal of my life. It was delicious, if I do say so myself, and it left me wanting more. Preheat the oven to 350 degrees. Butter and flour three 8-inch cake pans. Bring the Guinness and the butter to a boil in a small saucepan. 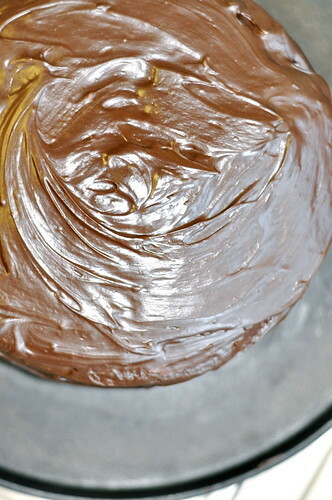 Add the cocoa powder and whisk until the mixture is smooth. Allow to cool slightly. Whisk the flour, sugar, baking soda, and salt together in a large bowl. Beat the eggs and sour cream together in another bowl using an electric mixer. Add the chocolate stout mixture to the egg-sour cream mixture and fold to incorporate. Slowly add the dry ingredients and beat carefully, avoiding over-beating. Divide between the cake pans. Bake for 30 minutes, or until a cake tester inserted in the center comes out clean. Cool completely on a wire rack before removing cakes from pans. Melt the chocolate, heavy cream, and coffee granules together in a bowl set over simmering water. 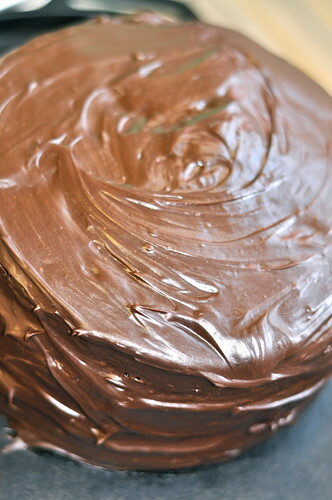 Allow to cool a bit before spreading over the cake layers. Dust with cocoa powder before serving.